Knowing how to end the fight with one hit will do you no good, if you are frozen in fear. If you really want to react with your best while using the tactics and techniques from End the Fight with One Hit, then you have to be able to think on your feet. It’s a must. This stuff doesn’t work if you are panicking. You have to react with calm confidence. 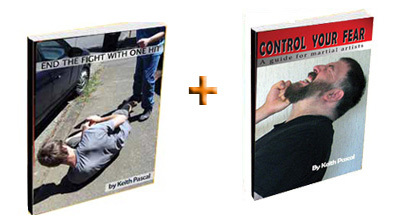 Enter Control Your Fear: A Guide For Martial Artists. Both End the Fight and Control Your Fear come as instant downloads … and both include valuable ebonuses. Click Here To Order Securely Through ClickBank.